Modulin, from 15 year old developer Noah Emerson, was updated with a whole lot of tweaks across the board! Lots of updates have been made including both bug fixes and the addition of highly requested features. Knobs no longer go past the end and wrap around. Instead, they stop in place at the end of the loop. The bug involving the selection of Bluetooth midi connections has now been fixed. A slightly darkened border has been added to a few pop-ups in order to make them more visible. The preset selector now reloads its state to the correct grouping upon reopening and even highlights the preset you are currently using. The oscilloscope fades out after the sounds have diminished to silence instead of abruptly disappearing. The buttons along the top action bar are a little more spaced out for those of you previously having trouble hitting the correct button. 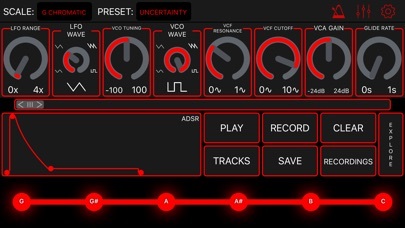 Animations involving the knobs and the ADSR when selecting a new preset have been adjusted to replicate the physical turning of an actual knob. One of Modulin's new features involves the metronome. It automatically starts playing upon starting a new recording. Also, the effects panel automatically collapses when you start the recording so that you can get right to playing. Delete confirmation pop-ups have been included to prevent you from accidentally deleting one of your most important presets or recordings. The waveform knobs for both the VCO and the LFO have added snap to position capabilities. You can simply tap on one of the outer waveforms to jump to that exact waveform. The pitch wheel of any midi controller now controls pitch and the modulation wheel is automatically mapped to the cutoff frequency parameter.